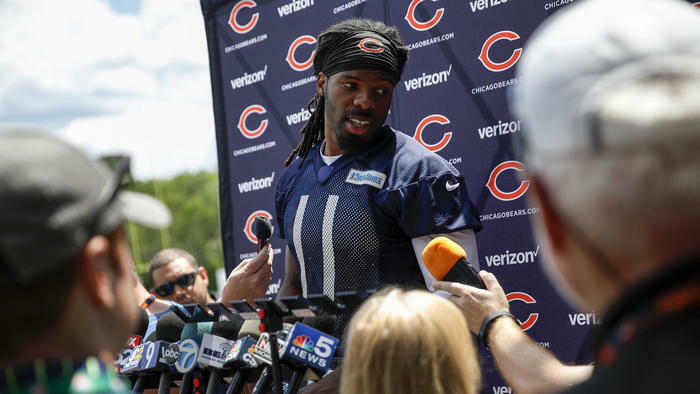 Kevin White missed an OTA practice that wasn’t relevant enough to conclude anything about this Bears squad and both media members and fans started writing him off as a bust. I agree with WGN’s Adam Hoge that the Bears could’ve helped the situation. John Fox could’ve been clear that White wasn’t injured; that it was just a day off for any reason he wanted to give. Fox’s vague responses can’t be trusted, so he really should’ve said something to ease concern. But should he have to do that for people to not jump off the deep end? As Adam Jahns said in the DBB Weekend Show last week, there are quite a few reasons why White may not have been practicing – reasons that have little to do with his current health. White was on the sideline and Mike Glennon told everybody he practiced the previous day. “After a stress fracture in his left tibia ruined his rookie season and a left fibular spiral fracture and severe ankle ligament damage cost him 12 games last season, White spent the last few months working to align his stride. I did some looking back and no severe ankle ligament damage was ever reported. Not by the Trib. Not by anyone. It was a high ankle sprain. Big difference. As for what the Bears know, they’ve seen White this offseason. Hell, they saw him the previous day. They know how he looks. What’s particularly odd about Campbell’s line of questioning in this column is that he asked Ryan Pace the same question about White’s speed in January and Pace answered, without hesitation, that he expects White to be just as fast before adding “this is 100 percent recoverable.” In fact, if we go back to that press conference in January Pace outlined the plan for White. So, why the confusion? After the report that White missed the OTA practice, fans and several bloggers proceeded to declare him a bust. He’ll never be able to play and we shouldn’t expect anything from him. Because he missed an OTA practice. Seriously. It’s worth noting that White returned to practice this week, for the media to see at Tuesday’s open OTA. And, by all accounts, he looked healthy. If there was some sort of debilitating injury last week, it went away really quickly. White needs to stay on the field. Two lower leg injuries to the same leg are concerning, but all indications from people who would know are that they weren’t connected and that he is expected to make a full recovery. I don’t know what kind of player White will be this year or in his career. I don’t see any real reason to change my opinion from when he entered the league. He has a lot to learn, but also has a lot to work with. We saw some of those tools last year but we also saw a player who was thinking too much. Maybe White will get hurt again. Or maybe he just isn’t any good. I don’t know if either will be the case. But the panic based on him missing a single OTA practice was beyond crazy.